Lime marmalade is so delicious and can easily be made at home. Lime marmalade is one of my favourite preserves. Since we now have our very own fruit-producing tree, I have started to make my own. 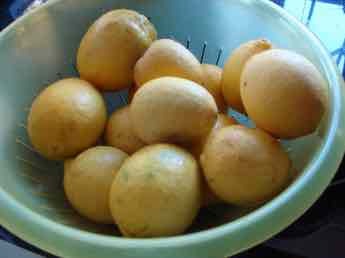 A high wind caused some lovely yellow windfalls in the last few days, so we picked them up, washed them and weighed out two pounds. This page was last updated by Bernard Preston on 4th January, 2019. Then came the hardest part. Getting off the peel without taking too much pith was not easy. I did this with a potato peeler, but I should think a sharp knife would also do a good job. Why are Helen and I so excited about this jelly? Just read these notes at lime nutrition. Lime marmalade is a delicious jelly on your low GI toast. 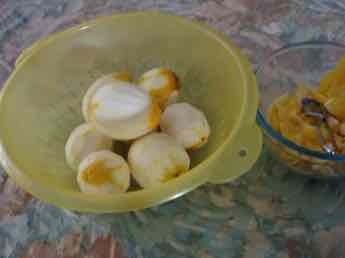 But eventually it was achieved, and I was left with egg-looking fruit in one bowl and peel in the other. Make sure you always use the pulp too when enjoying citrus as that is where the pectin is found that helps prevent prostate and presumably other cancers. I cut up the peel into very thin, small strips and put them into a muslin bag. This bag has been used many times for other fruit jellies, so it's discoloured, but completely clean! 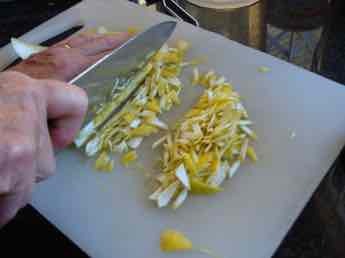 The peeled fruit was then sliced roughly. 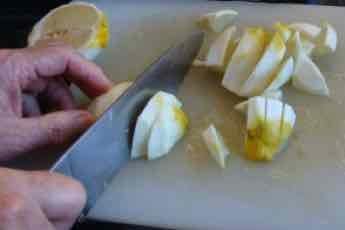 This was very easy compared to slicing up the peel. As only the peel will end up in the jar, these pieces do not need to be neatly cut; they will be strained off and discarded. 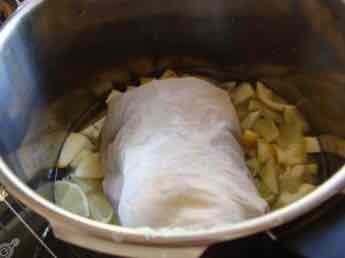 Both the chopped fruit and the bag of peel were placed in the cooker together with two and a half pints of water, brought to ten pounds of pressure, and left to boil for twenty minutes. The contents should take up no more than one half of the pot's volume. Pressure cooking softens the citrus much more quickly than just boiling. A pressure cooker is such a labour and time-saving device; avoid aluminium and watch for a sale price; usually around fifty dollars. The modern ones have a safety device so it's quite impossible for your lime marmalade to end up on the ceiling; provided you remember to set the catch. We've used ours three times today; Helen made the lime marmalade and I cooked first an organic butternut soup, and then the dogs' dinner. Is your pet on fast food? Expect the vet bills to start rolling in. These new devices are super safe. Just because we are crazy about preserving the planet for our grandchildren, we use solar pressure cooking but of course it works just as well on the utility or gas, only it costs you a bit more; actually a lot more; sunshine is free. After switching off the heat and waiting for about thirty minutes for the pressure to drop, I carefully removed the bag of peel. 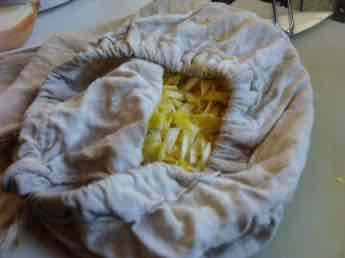 What remained in the cooker was put in another muslin bag and left to drip (in this case tied to the handle of a wheelbarrow outside!) 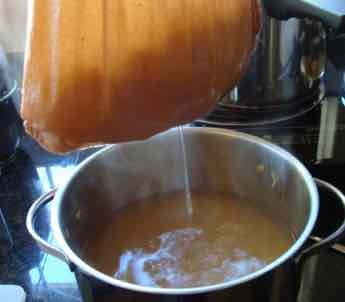 until most of the liquid had drained into another pot. The drained liquid was poured back into a large pot and three pounds of sugar added to it. 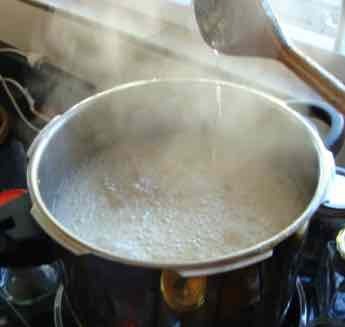 It should first be dissolved by stirring, then the heat turned up high for a few minutes till the mixture boils. We use the pressure cooker again, but it's not heated with the lid on obviously; you have to stir. After the heat was turned to zero, the scum was scooped off the surface with a large spoon. Then the washed peel was added to the pot and the power turned up again. Occasional stirring ensures no burning. Notice this is all being done on a portable induction stove; they are such a joy to work with, and not expensive. The provide instant heat and use less than half the electricity. At this stage, the heat should be kept as high as is safe. 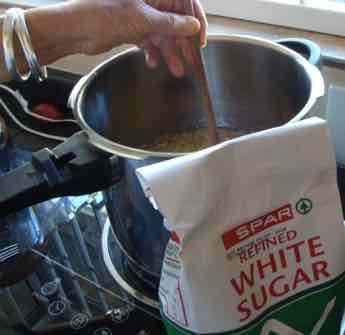 Be warned that the mixture should not be left unattended; sugary mixtures that have boiled over are horrible to clean up. Setting point was reached after about thirty minutes. I tested for the setting point by letting a little of the mixture cool in my wooden spoon, then allowing it to drip. When setting point is close, the drips near the end will fall cleanly. I also placed a few drops onto a cold plate which was then left in the freezer for a minute. If the cold drop wrinkles when pushed with a finger, you can be sure the jelly will set. I'm glad to say that I've done this often enough now that I no longer need to empty jars of supposedly ready but, in reality, very sloppy jelly back into a pot to reheat and get it to really set properly. All this is being boiled using a revolutionary hob; induction cooktop stoves use half the electricity and heat at twice the speed; what more do you want? Just like we'll all be driving electric cars within a very short few years, we will also be cooking by this method. Like all new ideas the price is dropping dramatically once the novelty is over. The mixture needs to be left to cool until a thick skin forms. This took about ten minutes. 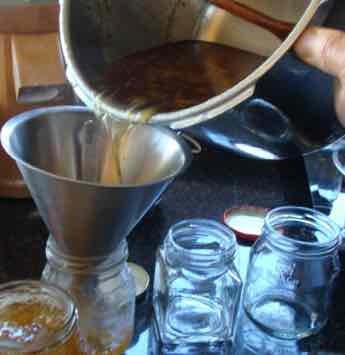 Then the chopped peel can be stirred in so that it is evenly distributed and won't end up rising to the top of the jar. The jars were filled and closed immediately. Our yield was about five and a half pound jars of lime jelly marmalade. Healthy choice foods give us a realistic chance of a reasonably healthy and happy old age; they affect our longevity, whether we'll get arthritic knees and our mood too. Lime marmalade on toast made from white bread, lavished in margarine, I would consider junk food. Make your own low GI bread, and use butter and lime marmalade, yes, butter is back, and you have a very healthy snack; not too much if you're seriously overweight. But low GI bread, butter and limes have many ingredients essential for health; just in moderation if you're obese, because of the calories in the snack. Are you in the dark green? Bernard Preston is a health nut, semi retired chiropractor with sufficient time now to devote to organic gardening, and his seventh book. Actually it's Helen who makes the lime marmalade; I just take the photos and enjoy the fruit of her labour. Well, I make the bread. Have you read the other six? They are inexpensive ebooks to be enjoyed on your Kindle or tablet, or even smartphone. That sugar is a devil, no doubt about it, and every one of us needs to strictly limit it, whether you are obese or not. How much is there in your lime marmalade? 3 pounds of sugar is 321 tsp, of 4,3g each. 5.5 jars provides 182 heaped teaspoons of marmalade containing almost exactly 1.8 tsp of sugar each; 7.5g of carb. So, one slice of toast with a heaped teaspoon of our lime marmalade provides about 25g of starch; quite a lot. A healthy person should consume no more than 150g of carbohydrate per day, an obese person less than 50g, and a diabetic less than 20g. I am prediabetic myself, so I try to stay under 100g per day; provided a go for a short ten minute walk after a starchy meal, my blood glucose remains normal; the sugars in the toast and lime marmalade get turned into glycogen instead. Lime marmalade on white toast is an indulgence, to be kept for high and holy days only. On 100% wholemeal low GI bread, if you can find it, with butter, I would call it a healthy food that needs to be enjoyed in moderation. Orange juice facts - do yourself a favour and avoid OJ from a carton at all costs; it's very fattening. 1. Fast Cooking, cooking times. 2. Prostate cancer and citrus pectin.